Mid-late season variety with very good hardiness and very good productivity. Bushes are vigourous, 1.7 m tall, open. 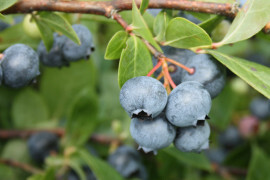 Blueberries are very large, very firm, medium blue with very good flavour. Good fresh market berry, easy to pick. Mid season variety with very good hardiness and very good productivity. Bushes are vigourous, 1.4 m tall, compact. 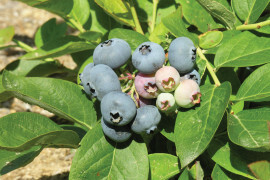 Blueberries are medium large, firm, very light blue and very sweet. Mid season variety with very good hardiness and excellent productivity. 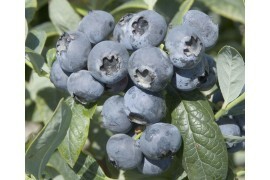 Bushes are very vigourous and upright, 1.4 m tall, Fruit large size, firm, medium blue with good flavour. Easy to reach, adapted to mechanical harvest. Very large fruit size, excellent shelf life . Mid season variety with very good hardiness and very good productivity. Bushes are vigourous, 1.2 m tall, compact and spreading. 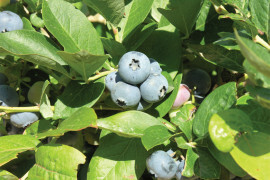 Blueberries are large, firm, dark blue with very good flavour. Desirable variety for cold regions since it will be easily covered with snow. Mid season variety with excellent hardiness and excellent productivity. Bushes are very vigourous, 1.4 m tall, dense with strong suckering. Fruit medium in size, firm, light blue with excellent flavour. Desirable variety for cold regions but needs more time to prune and pick. Mid season variety with excellent hardiness and excellent productivity. Bushes are vigourous, 1.5 m tall, dense but open. 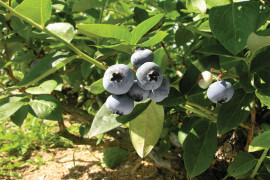 Fruit medium to large, firm, medium blue with good flavour. Desirable variety for cold regions and in heavier soils. Fruit drops in size as the season advances. Mid season variety with excellent hardiness and good productivity. 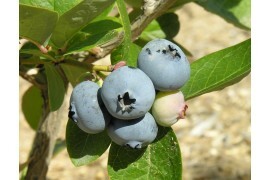 The bush is upright at 1.5 m in height and bears a good size fruit, firm and pale blue. Mid season variety with very good productivity and excellent hardiness. Bushes are vigorous, 2 m tall, upright and compact. 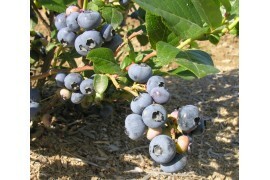 Fruit is very firm, light blue and excellent flavour. Very large fruit produces on huge bunches.